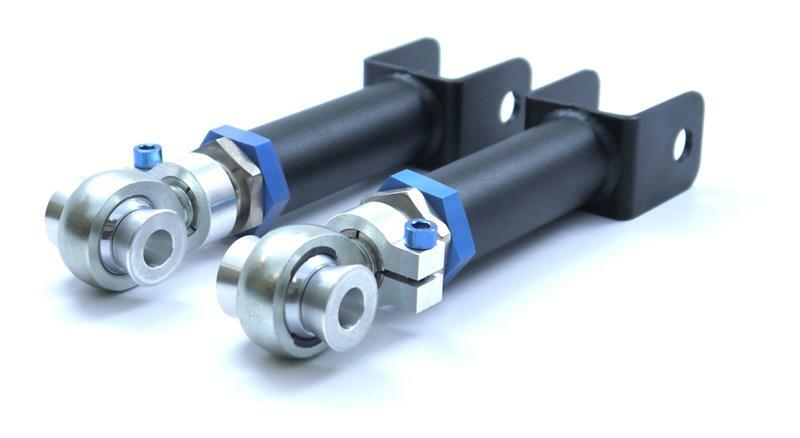 SPL Titanium Rear Traction Rods eliminate the mushy rubber bushings on the stock links to reduce toe change in the rear suspension under hard acceleration/braking and when going over bumps. This provides more stability and predictability to the rear suspension for tighter handling. SPL Titanium Series Links are also length adjustable to allow the rear suspension bumpsteer characteristics to be adjusted. SPL’s exclusive 4130 chromoly hybrid adjuster offers quick and precise adjustment, and is CNC gundrilled to reduce weight. Blue anodized titanium hardware shaves even more unsprung weight from the arms, without compromising strength.